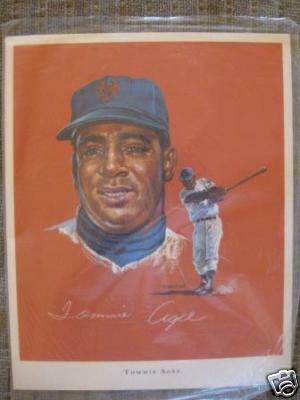 My latest pick to spotlight is this 1969 print of center fielder Tommie Agee. In 1969, Citgo Oil Company sponsored a series of eight art prints of the stars of the Miracle Mets. In addition to Agee, pitchers Tom Seaver, Jerry Koosman and Gary Gentry, outfielder Cleon Jones, catcher Jerry Grote, second baseman Ken Boswell and first baseman Ed Kranepool were also included. The artwork was done by John Wheeldon, a noted portrait artist. At the moment, this auction has no bids. For just $12.95, you could start your own collection of Citgo prints. I am interested in selling my collection of 1969 Mets Citgo drawings which are exactly like the Tommie Agee 8×10 you show in your add. I have at least 35 of each of the following player. I am not sure exactly how many of each card I have but they are all in mint condition. It will be interesting to hear from you. I’m not really looking to purchase any collectibles right now. I hope that you are able to find a buyer.